Dr Johnson's House is a unique venue in the heart of the historic City of London with a long history of entertaining, providing a charming and atmospheric setting for hosting a variety of different corporate and private events. Client get-togethers, product launches, birthday parties, formal dinners, drinks receptions and cheese and wine tasting events can all be accommodated in our Grade I listed building. (see attachments to the left for more details).We have a rating of 5 stars for hygiene. 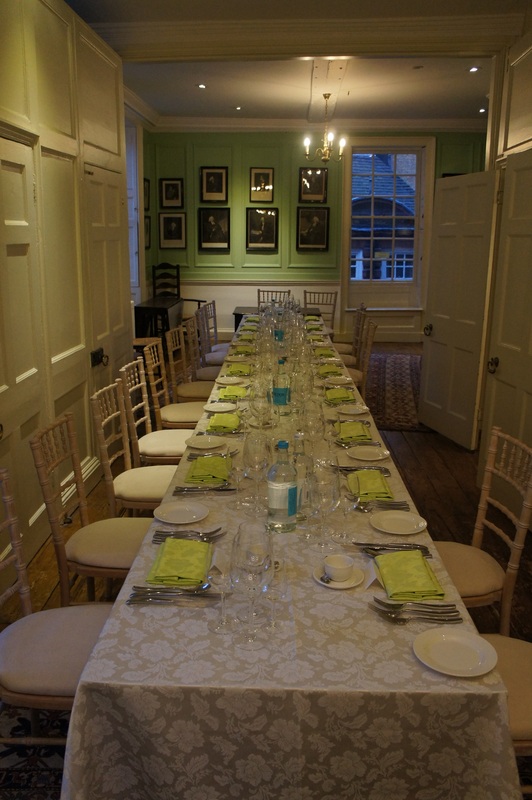 The House boasts beautiful historic interiors with panelled rooms, wooden floors and historic collections, which provide a quirky and memorable backdrop for your event. Perfectly situated with easy access to both the City and West End, our four-storey historic house is available for exclusive hire in the evenings, mornings and all day Sundays. We work with a range of suppliers - please see 'Recommended Suppliers' - and can offer curator's talks in addition. For an Information Pack on hiring Dr Johnson's House call 020 7353 3745 or fill in an enquiry form here. Dr Johnson's House is also available to hire for filming and recording. Please contact us to discuss your project.